Successfully Added USB + KVM 2 Port Switch - Hot Key + One Touch CPU Switch to your Shopping Cart. USB and KVM (Keyboard, Video, Mouse) switch with 2 ports for controlling 2 different PCs plugged from one monitor, mouse and keyboard, with the touch of one button or with a keyboard hot key. 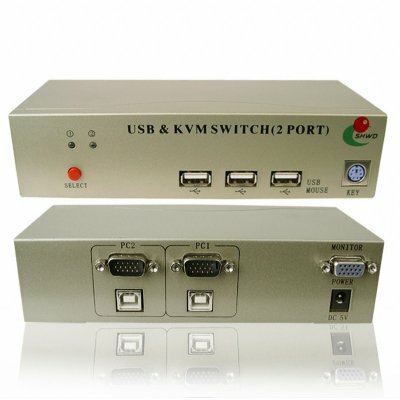 Unlike traditional PS2 KVM switches, this USB KVM uses USB as its upstream and downstream interface for easy, driver free installation and use. This is a perfect computer accessory for those pressed for space, or people who need to have two different computers running with different programs, but who do not want the bother of running extra wires, monitors, and keyboards or a mouse. Completely plug and play with most Windows OSs, this is a great computer device for any computer user, from novice to professional..